For a relaxing holiday away from the stresses of everyday life, escape to charming two-bedroomed Villa Nisan in beautiful Islamlar, Turkey. For a relaxing holiday away from the stresses of everyday life, escape to charming two-bedroomed Villa Nisan in beautiful Islamlar, Turkey. 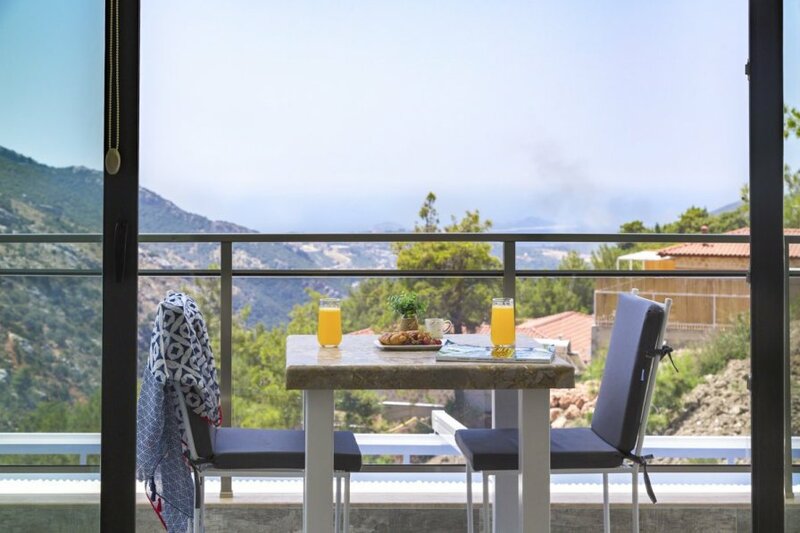 The villa is set in a stunning location in the foothills of the Taurus Mountains and boasts landscape views stretching through a valley all the way to the sea. Think stylish modern interiors, a large outdoor swimming pool and a spa-like Jacuzzi bathtub. With a sauna, steam room and gym too, Villa Nisan exudes luxury. The spacious villa is set over two floors with a double bedroom – featuring a furnished balcony and the circular Jacuzzi – and twin bedroom, also with a furnished balcony and those stunning mountain views. The decor is modern in style with white and creamy interiors and playful pops of colour in the soft furnishings. With its peaceful and quiet setting, Villa Nisan is an ideal mountain retreat to relax and enjoy the uninterrupted company of friends and family, while soaking up the spectacular views and surrounding nature. For a home-from-home experience, the villa is fully air-conditioned and comes with chic Chesterfield-style sofas, an LED television and a DVD player. The fitness room includes a cross trainer, free weights and treadmill – as well as floor-to-ceiling windows – so you can survey the surrounds while you train. Then top the lot by resting those muscles in the sauna or steam room. There are plenty of beaches in the area including Kaputas Beach and Patara Beach. Both have cafes, sun loungers and sunshades. You could also leave Kalkan harbour on a wooden gulet (classic Turkish sailing boat) to experience the full beauty of the coast. For an exciting cultural day trip instead, you could visit the sunken remains at Kekova. Boats go there from Kas, a 30-minute drive from Kalkan.